No 2 Ocean View is one of an exclusive development of 6 luxury townhouses in a fantastic location just yards from the sea and 150 meters from the centre of Luz village. 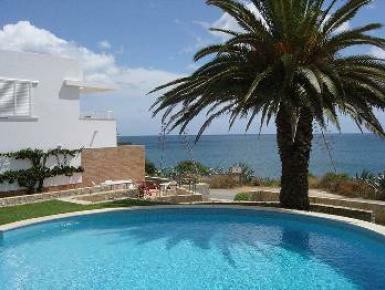 The clean sandy beach of Praia da Luz with its restaurants, beach bars and watersports is less than 250 meters away. The unit shares a large pool and has secure underground parking for 2 cars. Sleeping 6 in 1 double and 2 twin bedrooms, with 2 bathrooms and downstairs wash room, the townhouse is airconditioned and the large lounge/dining area has full length sliding doors onto the patio overlooking the sea. The large modern kitchen includes dishwasher, washing machine, gas hob, oven, microwave and large fridge with freezer. Fast WiFi broadband internet and Portuguese cable TV with sports channels. To see further details on this property such as an enhanced description, more photos, an availability calendar and full pricing information please click the button below. You will be redirected to the Click Stay website where you can also make an enquiry with the owner and book the property online. Click Stay are a subsidiary of Teletext Holidays and the Daily Mail & General Trust plc.